KOKOMO, Ind. — Amid the clangs of cookware, and buzz of conversation, Lauren Cole swipes the bit of gingery cake through the mango lemon glaze, pops it in her mouth, and closes her eyes, a frown briefly crossing her face. 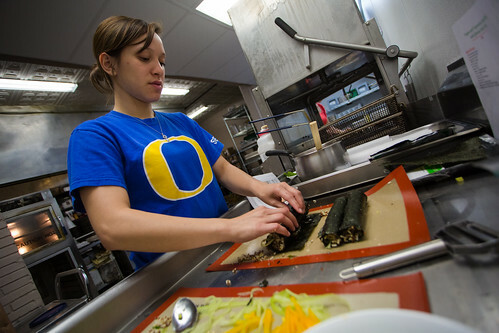 Bekah Martin prepares vegetarian sushi. For more pictures from the class, visit the album on Flickr. There's something missing from the glaze, but she can't quite put her finger on it. Her instructor, Kim Mossburg, samples a bite, talking softly to herself. "The sauce, the sauce, how to balance the sauce," she says, then suggests trying cinnamon, honey, and less lemon, in different bowls, to see which one creates just the flavor blend they seek. The mango upside down cake is one of the tamer dishes Indiana University Kokomo students are creating this summer session, in a class formally titled Cultural Gustatory Perceptions, but better known as bizarre foods. The course includes not only traditional classroom studies, but cooking and presentation time in the kitchen and dining room at Elite Banquet & Conference Center. "We're studying different styles of food presentation and preparation, and how the diversity and uniqueness of the ingredients impacts your perception of the food," said Mossburg, a registered dietician and adjunct faculty member. "This is interesting culinary research. It opens your eyes to the many different foods available, and how you can balance the flavors." Students work in groups to make a presentation one time during the session. On this particular day, students prepare and plate sweet nori crisps, made from seaweed, edamame and pea bruschetta, green bean and fennel salad with pecans, vegetarian sushi with quinoa, beet hummus, and grape, feta cheese, a millet burger on pumpkin bread, and walnut pizzas with balsamic syrup. Students not presenting also cook, preparing for their own presentations later in the summer session. Mossburg is grateful to Tom Trine, owner of the banquet and conference center, for letting the class use the kitchen. Cole, a health sciences major from Sharpsville, made the mango upside down cake with Sarah Brown, from Walton. They've enjoyed the hands-on learning the class offers, even if they haven't liked all of the foods they've tried. Chocolate pasta may sound delicious in theory, Brown said, but tasted bitter. "It smelled good, but yuck," she said. "The tomato pasta was much better." Their presentation is about how the way you plate the food makes a difference in people's willingness to try it. They plan to use a license plate from Hawaii, topped with a glass plate, to present their dessert. Cole hopes to work as a dietician with children, and said because children can be picky eaters, the tips she's learned should help in her career. Brown and Cole gave an enthusiastic thumbs up to the millet burgers created by their classmates, Aricka Lennon and Erika Freeman, who explained what was in them before cutting it into small pieces for the six tasters to evaluate on texture, flavor, and presentation. They actually created two burgers, made with millet, onion, beets, zucchini, eggs, and lemon, with an olive oil dressing and a sauce of cream cheese, maple syrup, and vanilla. One also included fennel seeds, to see if the tasters could notice they were there. Brown said she definitely could taste a difference. Erica Goodman, who admits to being a picky eater, tried an avocado for the first time during the class, and was surprised by how much she liked it. "I wouldn't have tried it if I hadn't had to for this class," the Kokomo resident said. "It definitely opened my eyes to all kinds of foods available." She made a fruit pizza, using quinoa instead of flour for the crust. "That gives it better nutritional value than a regular crust," she said. "We learned how to make tortilla chips from better ingredients, too, which is huge for me. I love my tortilla chips." Cora Peterson, Logansport, made a black raspberry fig delight, milling her own millet flour in a coffee grinder. She found the recipe online and tweaked it to use the ingredients discussed in class, she said. She was less excited to try to nori chips, as she's never eaten seaweed. "It was....different," she said. "This has been fun, because I like to try new things." Mossburg told all the students to be prepared to taste foods not typically consumed in American culture. They've cooked with unfamiliar grains, such as teff and amaranth, and tried some new spices. She said, though, they are not eating insects, which some of them had worried would be included. "It's amazing what some other cultures enjoy eating," she said. "It's fun to look at pictures of how they serve some of the more unusual dishes, and imagine how they might taste. I hope the students come away from this class with a greater respect for food diversity and culture. It will expand their thinking in the area of diet, and expand what they are willing to prepare and eat, which is a good thing."